"I do not blame the two distinguished Senators from New York, for they desire to protect New York City, as well as Chicago, Detroit, and similar areas. . . . In my opinion the two Senators from New York are, at heart, pretty good segregationists; but the conditions in their State are different from the conditions in ours." When President John F. Kennedy sent civil rights legislation to Congress in the summer of 1963, the “Desegregation of Public Education” section called for the commissioner of education to, on request from local school boards, “render technical assistance in the preparation, adoption, and implementation of plans for desegregation of public schools or other plans designed to deal with problems arising from racial imbalance in public school systems.” The administration’s bill referenced “racial imbalance,” the phrase preferred by northerners to describe their own school segregation, eight times. When it reached Congress, House Judiciary Committee chairman Emanuel Celler assigned the administration’s bill to Subcommittee No. 5, which he also chaired and which had a majority of northern Democrats who were likely to support strong civil rights legislation. Celler, a Democrat from Brooklyn, Ohio Republican William McCulloch, the ranking minority party member on the subcommittee, and deputy attorney general Nicholas Katzenbach played important roles in crafting a subcommittee bill that would have enough support from northern Democrats and moderate Republicans to overcome opposition in the House and Senate from southern Democrats and conservative Republicans. At McCulloch’s suggestion, the education section of the bill was amended to delete references to “racial imbalance,” thereby making the law applicable only to de jure school segregation in the South. When the subcommittee bill came to the House floor in February, Florida Republican William Cramer expressed concern that a recently decided case, Blocker v. Board of Education on Manhassett (1964), which found unconstitutional school segregation in Long Island, New York, could expand the scope of the bill. If the subcommittee had been able to consider this case, he argued, “I think . . . we would have taken another look at the bill and probably put something specific in it saying that it is not the intention of Congress to include racial imbalance or de facto segregation.” To remedy this, on February 6, 1964, Cramer introduced an amendment to section 401b so that the section’s existing definition of desegregation (“‘Desegregation’ means the assignment of students to public schools and within such schools without regard to their race, color, religion, or national origin”) was followed by a clarification: “‘Desegregation’ shall not mean the assignment of students to public schools in order to overcome racial imbalance.” In introducing the amendment, Cramer made clear that it aimed to prevent “busing” for desegregation: “The purpose is to prevent any semblance of congressional acceptance or approval . . . [for] any balancing of school attendance by moving students across school district lines to level off percentages where one race outweighs another.” Celler accepted the amendment without discussion, and this wording was enshrined in the 1964 Civil Rights Act. Stennis: As the bill came to the Senate, it contained a provision prohibiting the busing of children from one part of a city to another, in an attempt to achieve racial balance in the schools. Was not that amendment agreed to by Representative Celler of New York, the manager of the bill in the House? Did not he agree to it, on the floor of the House, rather than make a fight to keep the other provision in the bill? Is not that true? Sparkman: Yes. I do not know what motivated the Representative from New York; but he is from New York, and undoubtedly he had received many protests. In fact, probably he read in the New York Times, as we did, about 15,000 white mothers who protested against the busing of their children. Does the Senator from Mississippi remember that incident? Sparkman: At one time the busing of schoolchildren was done; and 15,000 mothers in New York—in Westchester County and the adjoining areas—vigorously protested against it. I do not know whether their protests had any influence on Representative Celler. . . . I do not know what motivated him to do that; but . . . when the bill was brought up in the House, a provision was written into it by someone who wished to make certain that the ghettos . . . remain just as they are; and Representative Celler accepted the amendment. . . . By the way, the administration did not ask for that provision. Stennis, Sparkman, and the other senators who criticized Celler were not invested in desegregating New York’s schools; rather they wanted southern states to have the same latitude to define and largely ignore school segregation that New York, Ohio, Illinois, and other northern states enjoyed and would continue to enjoy under the bill. While northern senators disagreed with their southern colleagues’ charges of hypocrisy, they agreed that the civil rights legislation was amended to prohibit “busing” for school desegregation. New Jersey senator Harrison Williams described how “segregationist propaganda” had created confusion among his constituents and had led many to write to him that “busing should be forbidden.” Williams received these letters, he said, “despite the fact that section 401(b) in title IV of H.R. 7152 specifically prohibits the busing of students across town, in order to achieve racial balance in the public schools. 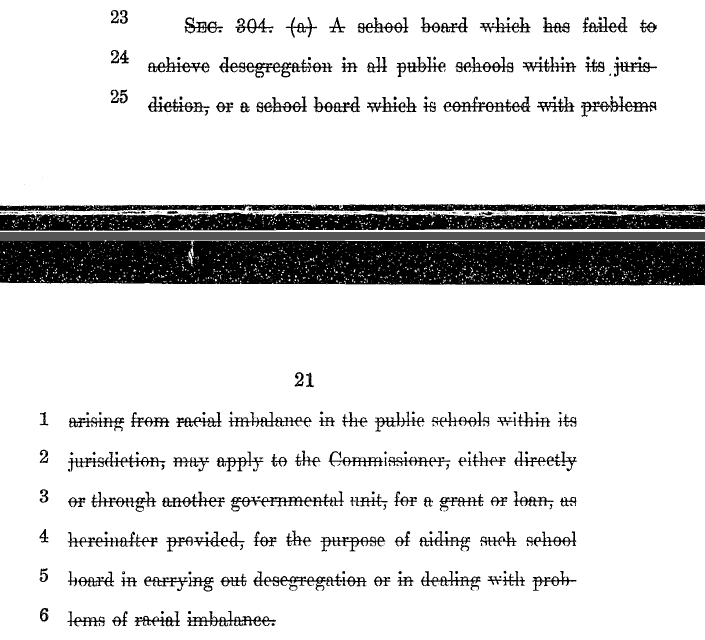 That provision clearly related to busing, and legislatively prohibits busing in order to achieve racial balance in the public schools.” The Chicago Tribune, which staunchly opposed school desegregation in the city, regularly quoted Title IV, section 401b, of the Civil Rights Act of 1964 to support their case against school desegregation. 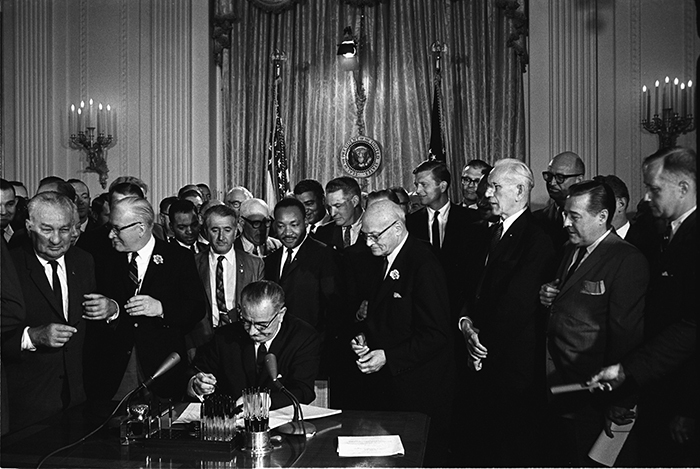 These amendments and antibusing provisions were designed to keep federal civil rights enforcement of school desegregation focused away from the North, and white politicians and parents in Boston, Chicago, New York and elsewhere regularly pointed to the 1964 Civil Act to justify the maintenance of white schools. In this way, the Civil Rights Act allowed school segregation to exist and expand in northern cities.